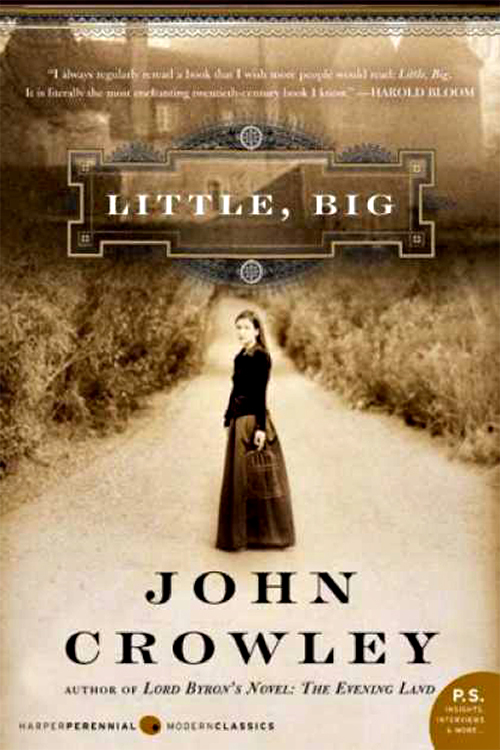 For the past two weeks I've been reading Little, Big by John Crowley. It is a fantasy novel that has won numerous awards, and it was originally published around 1980-81. The saga spans four generations of the very eccentric Drinkwater family beginning at the turn of the last century and ending in a near-future dystopian America (circa 2000....remember the book was published around 1980). The family lives in a fanciful house called Edgewood which is built entirely out of time: 52 doors, four floors, seven chimneys, 365 steps, etc. Edgewood is a gateway to the faery realm and is located north of a large American city (assumed to be New York). The novel begins with the third generation as Smokey Barnable is walking from the city to Edgewood to marry Daily Alice Drinkwater. The Drinkwaters and their extended family see and communicate with fairies. Smokey does not possess this ability, and the family is very vague and secretive when he asks questions. He accepts this in them and doesn't really seem to mind this exclusion out of his love for Alice and his duty to Edgewood. Some of the story is told in flashback, and I particularly enjoyed reading about the design of the house with its many eccentric façades and imaginary rooms. The reader only gets small hints and glimpses at the fae, but the Drinkwaters' story is a Tale that is being played out and manipulated by the fae. There are many literary allusions in the book (especially mythology) as well as references to stories and tales, from fables to television soap operas. Everything in the book is either a hint, a clue, or a whisper. And just when I thought there was actually going to be a plot surrounding the fourth generation Auberon and his lover Sylvie (nicknamed Titania), I was fooled. I really don't get the point of the Tale nor the "awakening" of Frederick Barbarossa (rather than Arthur or Charlemagne) who becomes the despot of the free world as he wins the American presidency. The syntax in this book is so poor and distracting it makes it difficult to focus on the story and maintain suspension of disbelief. Case in point: the word Somehow was always capitalized in the book, and it's used often. The omniscient narrator's voice drove me to distraction, and not in a good way at all. The narrator has ADHD, and the (almost) stream of consciousness narration (and at times dialogue) was exhausting. It's upsetting that I wasted so much time on this book, especially since it was highly recommended to me by one of my favorite Indie bookstores. In all honesty I can't recommend it unless you're simply curious as to why Harold Bloom wrote of its importance. I hope you've actually enjoyed a book lately. If you have, please share! Oh! Wow! Thanks for saving me! This book was highly recommended by a VERY popular blogger. I actually bought it and downloaded it to my nook. I have started it several times and then stopped. I'm glad I'm not the only one that just didn't get it. :) Just wish I hadn't paid for it. Thank you for hosting! I'm glad I got my act together to get my review posted. Oh Fantasy and mythology but hard to read not so sure...it does sound like something I would love but I am having a hard time reading anything these days, a bit burned out I fear. Will have to put this one on the maybe list. Great Review! It's a pity that is wasn't a good read, at first it sounded like such an interesting book with so much potential. Here's to a better book next time! So disappointing to spend so much time on a book and have it not be good. I hope you start on something good to take the bad taste out of your mouth. Crumbs! I teach English for a living and don't think I would be able to fathom that book. Oh no, I’m not happy when I’ve read a book I thought would be good and come away with disappointed. Thanks for sharing this. It’s not often you give a negative review. Oh, that stinks! It sounds like it had the potential, too bad the author could not follow through. Your first few descriptions made me feel that this will be a great read. Turns out, some books are better off in the beginning. Sustaining the readers' interest is a challenge for every author. Thank you for the honest review. Have a great weekend Ricki! I won't bother with it. It's so hard finding really good books to read or listen to. I wish I could find a good one to listen to on my drive to and from work.